Ever wanted to learn to play a musical instrument? It’s never been easier thanks to technology. YouTube is an ideal starting place, providing extensive tutorials, that doesn’t involve you having to purchase lessons. Alongside that, the App Store has plenty of apps for teaching you how to play numerous different instruments. GarageBand is better known as Apple’s way of making it easy for you to record music on your iPhone or iPad. It’s more than that, though. It essentially provides you with some virtual instruments wherever you take your devices. While there aren’t specific lessons here, it’s ideal for when you want to have a quick jam and practice session while out and about. Place your iPhone or iPad by your piano or keyboard and start playing, Simply Piano will immediately offer you feedback on how you’re doing. Alongside that, it offers 5 minute musical workouts, tips on how to read sheet music and comes with a wealth of fun songs for you to learn to play. Yousician will help you learn to play the piano, guitar, bass or ukulele. Offering step by step video tutorials, it’ll guide you from the very basics to far more advanced techniques. Over 1,500 missions and exercises are included, with specific lessons on music theory also provided. Weekly challenges keep you coming back for more. 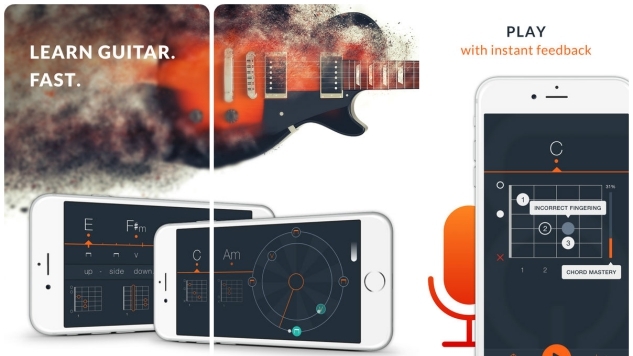 Uberchord is like having your very own guitar teacher. It listens to how you play, adapting to your needs, thereby providing you with personalized advice and tips. Handcrafted courses are included, teaching you all the necessary techniques while using well known songs. There’s new content each week, along with a song trainer for teaching you to play specific tracks. Want to learn to sing in perfect tune? SingTrue is the app for you. Offering over 30 interactive exercises, it’ll help you train your voice so that you can sing easily and confidently. Using your iPhone’s microphone, the app analyzes your singing, providing you with personal feedback. Even inexperienced singers should be surprised to learn that their voice is far better than they expected. Voice Training works in a similar way to SingTrue, but with a little more detail. It’ll highlight which note you should be singing, alongside which pitch you’re currently singing. A series of exercises help you expand your vocal range by relaxing your voice, with singing games available to keep you keen. There’s even interval tests ready for your music grade exams. Kind of like Guitar Hero for the piano, but a little more educational, Tiny Piano is a fun starting place for the aspiring piano player. Giving you the choice of handling the timing, you can choose to play each song fast or slow. There’s over 400 songs available so there’s plenty to dive into. It’ll give you a great sense of satisfaction in no time. With a focus on well known songs from all your favorite artists, Piano Free should make you feel quite comfortable. You can choose from five different instruments, such as grand piano, Harpischord, electric keyboard, organ and glockenspiel, before adjusting the speed to your ability level. Force touch support recreates the true sound of a piano too. Easy Music is aimed at young children but it’s actually a pretty good starting point for anyone. It’ll help you learn to recognize notes, pitch, rhythm and melody, while still having fun. It’s simplistic stuff but if you’re having trouble understanding some of the theory behind learning an instrument, it’s a great form of musical instruction. A new inclusion to the App Store, Justin Guitar Beginner Song Course offers an interactive step by step course that teaches you chords, strumming, and everything else you might need to know. Instructional videos and a FourChords guitar karaoke style paves the way, ensuring the learning curve is never too steep. Over 200 songs are included in the collection.